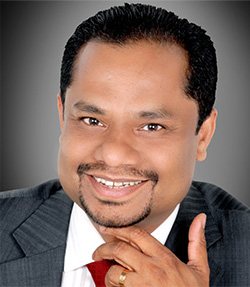 Sebastian Joseph is the Chairman and CEO of Knowlton International, a prime mover of high-level business operations through setting the strategic road map and overseeing implementation framework of the company’s business in the highest quality standards. Joseph has over 25 years experience with a proven track record in Auditing and Assurance services, Finance and Risk Management, Strategic Direction and Oversight, Resource Planning and Financial Modeling, Project Management and Negotiation, Establish Policies, Procedures, Controls and Systems. His career journey began as Management Consultant with M/S Sharp & Tannan Associates Bombay. With unwavering dedication and continued quest for excellence, he successfully progressed in his career and held distinguished positions in Finance Departments of various multinational conglomerates in Saudi Arabia, Bahrain & UAE. His significant career milestone came in 2008 when he was headhunted by the Abu Dhabi Ruling Family, and given the position of Chief Financial Officer in the office of the then Deputy Prime Minister of UAE. Later, he was holding the dual responsibility of Chief Operating Officer and Chief Financial Officer in the office of the Ruler of the UAE’ s Western Region. In this high profile position, he administers the role of the Financial Advisor/Owner’s Representative in several committees, which include Board of Governors/Directors/Trustees in Infrastructure, Educational, Media, Philanthropic, Cultural and Community development activities. With his extraordinary achievements in business operations, finance as well as enterprise-level planning and decision- making, he has proven his worth as a business leader reaching the pinnacle of success being recognized among the Indian Super 100 Business Leaders and Professionals in the Middle East & Africa in 2014. Joseph is a Fellow member of the Institute of Chartered Accountants of India; associate member of the Association of Certified Fraud Examiners, Austin, USA; and a certified professional in International Financial Reporting Standards (IFRS). He is a Chartered Accountant and holds a degree in Commerce. As a visionary thinker with global perspective and entrepreneurial drive, he maintains active membership to various Professional and Regional Associations as well as maintaining professional network with high-ranking Executives across the globe. Bachelor degree in Commerce from MG University, Kerala, India.